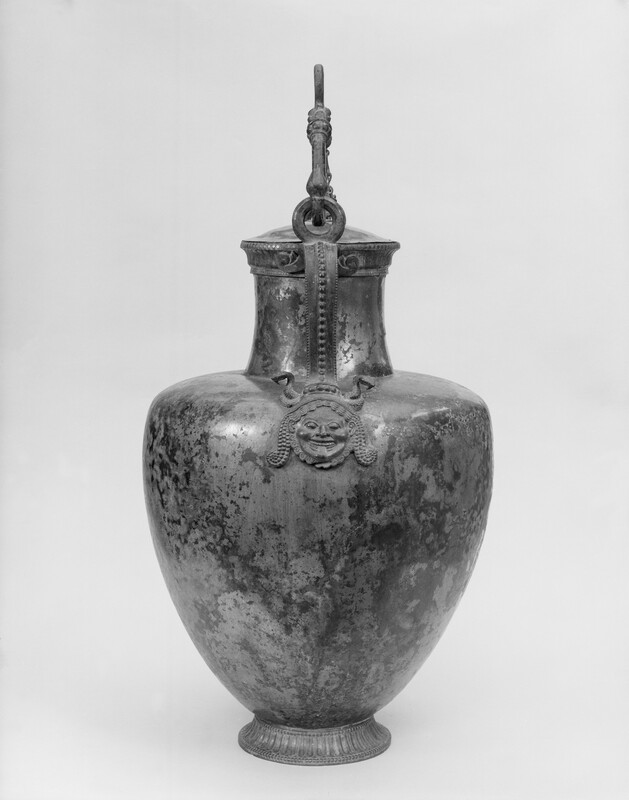 An amphora is best described as a large Greek jar with two handles and a narrow neck. The images, designs, and inscriptions on the side of this piece are easy to point out. The vertical handles follow along the width of the amphora with a beading design along the length. They all attach to the shoulder of the vessel with a medallion in the form of a gorgon’s head. This vessel is “complete with two coiling snakes worked fully in the round.” (Mertens) More stylistic portions of this piece include a tongue pattern at the foot and the lip and stylized lotus buds on the rings of the vase. 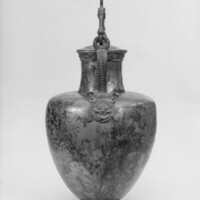 Most importantly the whole design of the piece gives signs of “organic growth” (Mertens), concerning placement, form, and functional aspects of the amphora as a whole. Moreover, this piece is inspired by mythological creatures such as griffins, and gorgon heads. 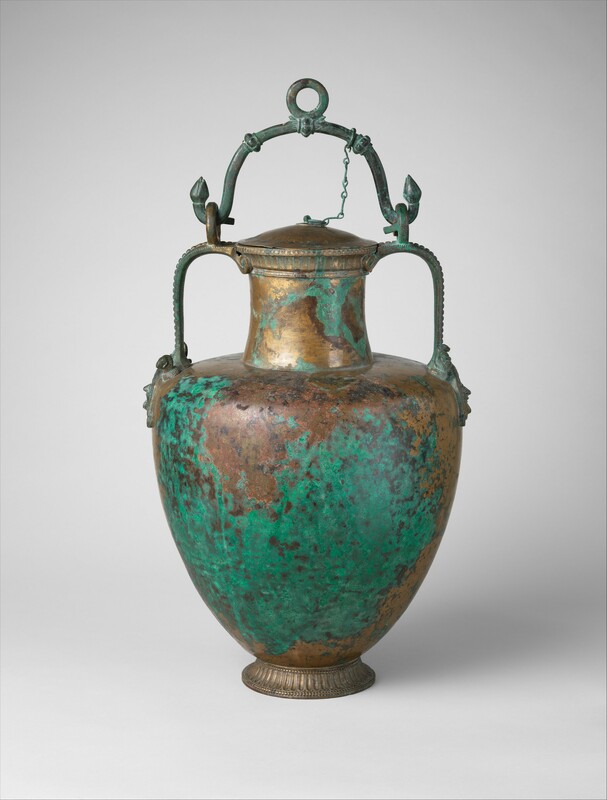 This vessel is very rare due to the simple fact that it is made of bronze, while most amphorae are ceramic. 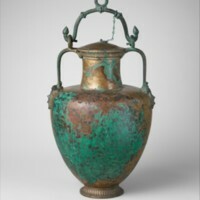 The rarity also is because most bronze amphorae would be melted and reused for something else. 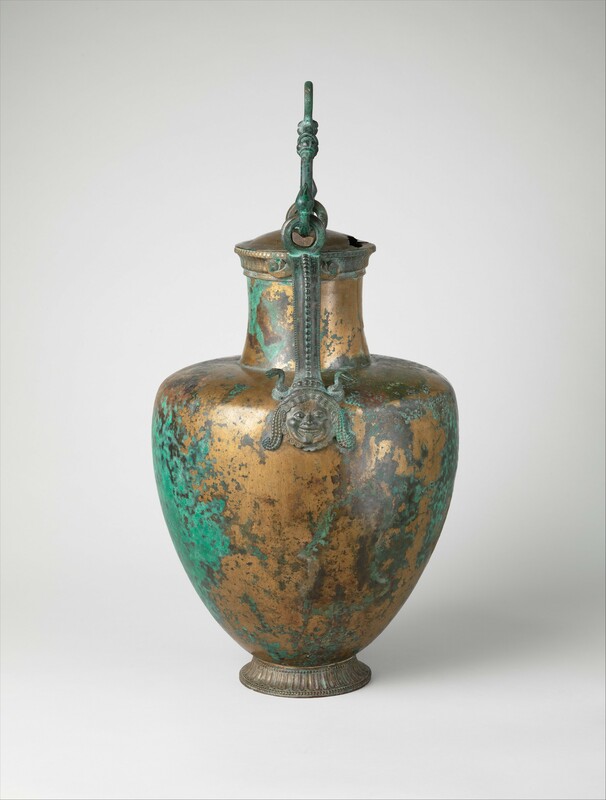 If I were to find a work in Janson’s History of Art that I could supplement with the neck-amphora with a bail handle, I would say the Women at a fountain house (figure 5.26) would be the best one. This is mainly due to the simple fact that it is the same design layout, although it is a vase painting and ceramic. Most importantly, it would introduce a new element to the book. 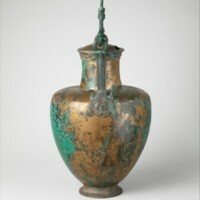 This element is the addition of a vessel in bronze form, something that the textbook does not contain. Last quarter of the 6th century B.C. ,” accessed April 22, 2019, http://metsurvey.kenyoncip.org/items/show/19.